In India, Spreading Green Gospel Among Pilgrims Every year, millions of Sikhs flock to the holy city of Amritsar in northern India, adding heavily to the city's carbon footprint. Now, officials and activists are encouraging environmentally friendly practices such as using solar energy and reducing waste. The Golden Temple at Amritsar, India, doesn't look like an environmental pressure point. The gold-sheathed building gleams serenely as a jewel box in the midst of a broad reflecting pond. Music serenades pilgrims as they cross a causeway to reach the shrine. Devout Sikhs from all over India and the world come to Amritsar by the tens of thousands every day — and therein lies the rub: The pilgrims eat, pray and love their shrine almost to death. Pilgrims add to a sizable carbon footprint in the northern Indian city, where a dense population and heavy industry already are degrading air and water quality. Amritsar is by no means unusual. Travel groups, such as the World Tourism Organization, say more than 300 million people travel for religious purposes each year. Some of the major holy cities have formed an environmental group — the Green Pilgrimage Network — to encourage environmentally friendly practices among religious travelers. They include Assisi in Italy, Jerusalem, various Shinto shrines in Japan, Lou Guan in China, and St. Albans in England. 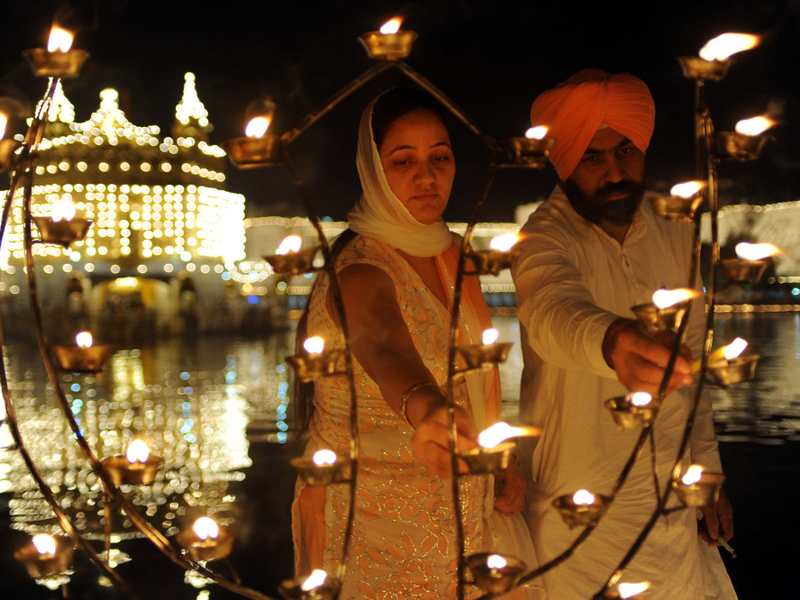 Sikh devotees Puneet Kaur (left) and Gurmeet Singh light lamps as they pay their respects at the Golden Temple in October. Temple authorities are considering installing solar panels for the lighting system to make it more environmentally friendly. Amritsar is a good example of the strains that religious devotion can put on a site. At 4 a.m., the brightly lit courtyard of the Golden Temple is already pulsing with life. 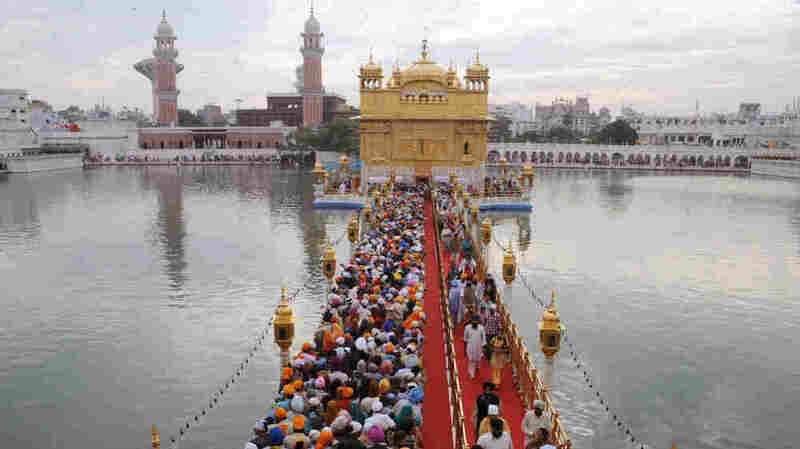 Thousands of pilgrims pray and sing as they wait for the daily ritual in which the holy book, the Guru Granth Sahib, is carried to the sanctuary. The book, covered in rich cloth, is placed in a litter under a golden canopy and carried across a causeway, followed by devotees. Most of the men wear the carefully wrapped turbans and uncut beards that are the most familiar marks of their religion. 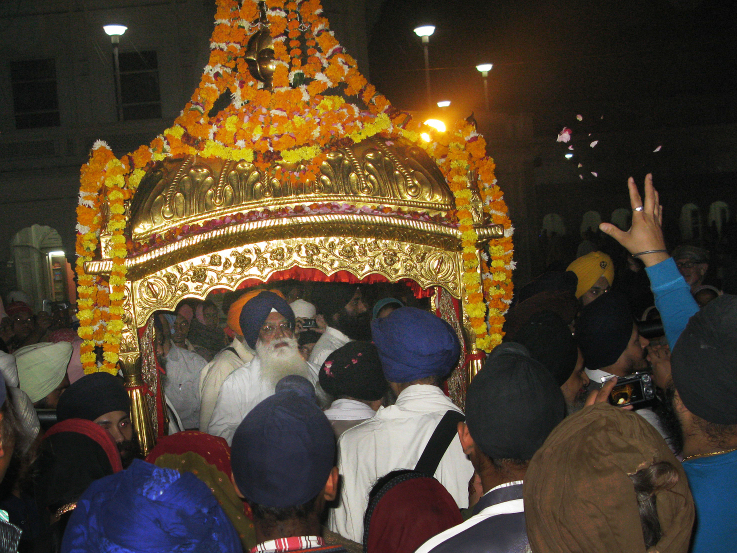 Sikhs stay in touch with their faith by visiting this and other holy sites as often as they can. "Everyone has to be here, once a year, twice a year," says Ravneet Pal Singh, who works for the environmental group EcoSikh. "People come from all over the world, wherever we have Sikh communities. They come back to India, and the one place they surely will go is the Golden Temple." Singh says about 100,000 pilgrims and tourists visit Amritsar each day; the number triples on festivals and holy days. "They come here, drink a lot of water and use all those facilities that you have to use when you travel to such a place," he says. "So we can change many things and reduce the carbon footprint a lot." Devotees reach out to the gilded litter that carries the Sikh holy book, the Guru Granth Sahib, to the Golden Temple in Amritsar. Singh is particularly fired up because he has just returned from a meeting of other representatives of the Green Pilgrim Cities Network in Assisi. He was part of a small delegation of city and temple officials who pledged to try to incorporate environmentally friendly practices in Amritsar. Singh says the ideas for Amritsar include solar panels for the lighting system that keeps the temple gleaming throughout the night. Other plans revolve around a core tenet of the Sikh religion that believers provide food for anyone who needs it. At the Golden Temple's communal kitchen, volunteers prepare and serve about 85,000 meals each day. Singh is proud that the meals are served on stainless steel plates and bowls, so there's no plastic waste, but he says the temple wants to extend green practices to the cooking and cleaning. That will include installing solar water heaters for the scullery, where steel dishes clash like cymbals as hundreds of volunteers wash up. Temple authorities also want to make better use of water, using sophisticated ways of harvesting rainwater. Singh says the organizers hope to educate pilgrims by reminding them of the Earth-friendly messages that are already part of Sikh theology. "The air is our master, water is our father, and this Earth is our great, great mother," he recites. "So this is [a] direct relation that the Sikh masters have given to us, and we should now reflect the way they taught us." Singh says the Green Pilgrim Cities Network estimates that about 40 percent of the world's people make religious pilgrimages at some point in their lives. That, he says, is a lot of people who are potentially ripe for Earth-friendly messages.